The Box and Block Test (BBT) measures unilateral gross manual dexterity. It is a quick, simple and inexpensive test. 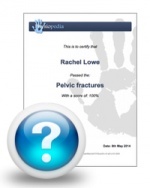 It can be used with a wide range of populations, including clients with stroke. The BBT cannot be used with clients who have severe upper extremity impairment or those with sever cognitive impairment. Individuals are seated at a table, facing a rectangular box that is divided into two square compartments of equal dimension by means of a partition. 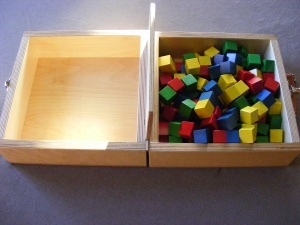 One hundred and fifty, 2.5 cm, colored, wooden cubes or blocks are placed in one compartment or the other. The individual is instructed to move as many blocks as possible, one at a time, from one compartment to the other for a period of 60 seconds. Standardized dimensions for the test materials and procedures for test administration and scoring have been provided by Mathiowetz et al, 1985. To administer the test, the examiner is seated opposite the individual in order to observe test performance. The BBT is scored by counting the number of blocks carried over the partition from one compartment to the other during the one-minute trial period. Patient’s hand must cross over the partition in order for a point to be given, and blocks that drop or bounce out of the second compartment onto the floor are still rewarded with a point. Multiple blocks carried over at the same time count as a single point. Clients are scored based on the number of blocks transferred from one compartment to the other compartment in 60 seconds. Score each hand separately. Higher scores are indicative of better manual dexterity. During the performance of the BBT, the evaluator should be aware of whether the client’s fingertips are crossing the partition. Blocks should be counted only when this condition is respected. Furthermore, if two blocks are transferred at once, only one block will be counted. Blocks that fall outside the box, after trespassing the partition, even if they don’t make it to the other compartment, should be counted. Detailed patient instructions as outlined by Mathiowetz et al. Trial period: Start the stop watch at the word go. When 15 seconds has passed, say "stop." If mistakes are made during the practice period, correct them before the actual testing begins. On completion of the practice period, transport the cubes to the original compartment. Return the transported blocks to the compartment as described above. ↑ Mathiowetz, V., G. Volland, et al. (1985). "Adult norms for the Box and Block Test of manual dexterity." Am J Occup Ther 39(3160243): 386-391. ↑ 2.0 2.1 2.2 Mathiowetz, V., G. Volland, et al. (1985). "Adult norms for the Box and Block Test of manual dexterity." Am J Occup Ther 39(3160243): 386-391.